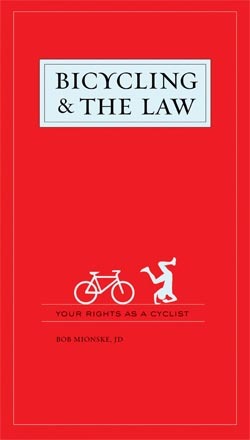 VeloPress is pleased to announce the publication of a legal reference book for cyclists by attorney Bob Mionske. Bicycling & the Law: Your Rights as a Cyclist is designed to be the primary resource for cyclists to consult when confronted with a legal question. The book is now available from VeloGear.com and in bookstores and bike shops. Bicycling & the Law includes a foreword by Lance Armstrong that details a frightening experience with cyclist harassment. The book has been endorsed by George Hincapie, Bobby Julich, Chris Carmichael, and many cycling advocacy organizations (see below). Many of America's 9 million avid cyclists are confronted with confusing questions about traffic law, cyclist harassment, product liability, theft, and insurance contracts every year. Bicycling & the Law provides readers with the knowledge to avoid many legal problems and informs them of their rights, their responsibilities, and their recourse if they are confronted with a legal problem. According to the League of American Bicyclists, more than 9 million cyclists describe themselves as "active cyclists," weekend riders, off-road riders, commuters, and amateur and professional athletes-who face the daily challenges of commuting in traffic, overenthusiastic dogs, road hazards, traffic codes, harassment, road rage, bicycle theft, group rides, and property damage. This book is for them. Bob Mionske makes the law both entertaining and understandable to the non-lawyer, while presenting an accurate and thorough explanation of the laws governing bicycles and bicycling. Bicycling & the Law is the definitive resource answering those questions and the only book of its kind on the market. Bob Mionske is a Doctor of Law with a private practice that focuses on issues confronting cyclists. He writes a popular column for VeloNews.com called "Legally Speaking with Bob Mionske." Mionske took fourth place in the 1988 Olympic Games cycling road race and was the 1990 U.S. National Road Race Champion. Mionske's legal practice is based in Portland, Oregon. This book should be read, digested, and practiced by cyclists and motorists alike. It should be a part of driver education and bicycle safety programs. Bicycling & the Law has one further, rare quality: it is eminently-and delightfully-readable. Cycling can be a tough job, whether you're riding to work or training for a race. Bob Mionske sets the record straight on cyclists' rights. If you love to ride, you should know what's in this book. Bob Mionske's superb Bicycling & the Law has filled a critical gap on our bookshelf, synthesizing essential information on the legal rights and responsibilities of cyclists into a coherent, comprehensive, and engaging volume. Anyone who rides a bicycle in the United States, whether commuter, roadie, tourist, messenger, or joy rider, should have a copy of this book at hand. It works beautifully as both a reference and a very readable narrative-pick it up anytime for fascinating tales of bicycle code and culture, and zoom in on the specifics and particulars as you need them. Knowing the rules is a key to safe bicycling. Bob Mionske sheds light on our complex legal system and arms bicyclists with the knowledge to make smart decisions to protect their rights. Big gains require real effort, and Bob Mionske has done the heavy lifting for all cyclists. Bicycling & the Law is a huge step forward for our rights on the road. In fact, everyone who rides should have a copy of this book. Bob Mionske's book should be a must read for all cyclists to educate and inform them on their rights and responsibilities. We all hope that accidents won't happen to us, but common sense, common courtesy, and safe riding procedures are things we should all understand and follow. Cyclists should never leave the house without a rain jacket, a frame pump, a spare tire, and basic knowledge of this book. Bicycling & the Law will promote cycling as a fun and affordable means of transportation and help create healthier, more livable cities. Mionske sets a positive example for both cyclists and drivers on how to share the road. What an exciting book to read for all cyclists. The information here will only enhance your riding as you will be aware of your rights as a legal road user. It is a must read. Anyone who has ever spent much time riding on the road knows how vulnerable it can feel to be a cyclist sharing the roads with cars, SUV's and trucks. This book is a fantastic resource to arm cyclists with basic information that will both educate and empower them. A comprehensive and up-to-date guide to virtually all aspects of the legal system as they affect bicycling. Although directed at cyclists, this volume is also an important reference for law enforcement officers, attorneys, and judges. Everyone from the serious cyclist to the person thinking about dusting off the long-neglected bike in the garage will benefit from reading this book. Cycling instructors, avid riders, beginning cyclists, bike messengers, parents concerned about the perceived dangers of cycling for their children, those who are charged with providing suitable accommodations for cyclists, those charged with protecting the rights of cyclists, should at least scan Mionske's book.